We, as NHL fans, perpetually complain about the game's status as America's "the fourth sport." We bastardize ESPN for not covering the sport with any kind of regularity. In truth, we harshly criticize any coverage of our favorite teams, and the sport in general, that doesn't hold with our own personal values and definitions of "fair coverage." That's because fans are consumers and when the product isn't to our liking, we feel we have the right to complain. We are not wrong to do so. The National Hockey League did not have a good week this week. Really, the League has not had a good season. They're current sleeping in a bed of their own making. Of course, the players and the Player's Association have helped as well. 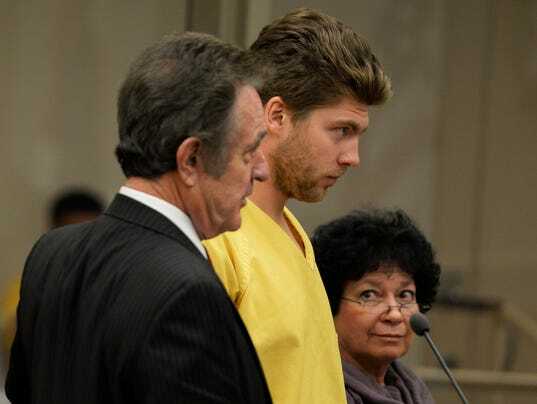 The week started out rather bizarrely, as Colorado Avalanche goaltender Semyon Varlamov was arrested on what was initially reported as simply "domestic violence charges." As we would later find out, counts included 2nd degree kidnapping and 3rd degree assault charges. - which are only allegations at this point to be completely fair to the newly-labeled "Defendant." To everyone's astonishment, Varlamov didn't miss a single start. The Avs weren't concerned. The NHL didn't much seem to care. The NHLPA was as silent as ever. The week, in terms of hockey's public relations, couldn't have gotten any worse. At least we thought. With the Philadelphia Flyers trailing the Washington Capitals 7-0 early in the 3rd period, odds were, there was going to be a fight happening. Maybe two. That's what happens in hockey. Players get desperate to save face and possibly kickstart their team, either for the game currently being played or for the next one. What nobody expected was the debacle that ensued. All at 5:31 of the 3rd period. Front and center of the gladiatorial display was Flyers' goalie Ray Emery who unwarrantably attacked Caps' netminder Brayden Holtby. By now, everybody's seen the video and read numerous opinions on the matter. The important thing to note here is that, again the NHL did nothing. The Flyers organization did nothing. And the NHLPA did....well....what they always do. Even after Emery essentially admitted that the fact that Holtby wasn't willing to fight did not concern him because he was gonna get his, neither of the aforementioned organizations felt the need to address this issue in any kind of punitive or substantive manner. All Emery recieved for his on-ice conduct was 29 penalty minutes and the symbolic Third Star of the night. Not bad for a night in which you give up 4 goals on 15 shots. So, the week got worse. The season thus far has not been good for the NHL. It's not been good for its players. It's not been good for its fans. I don't honestly know what courses of action these groups could take that would be "fair" either. Varlamov appears to be a terrible person. But the law is the law and the sport is the sport. Does the NHL have a responsibility to take action against him when, by that law, he is still innocent until the court system declares him otherwise? Same question applies to both the NHLPA and the Avs. Emery presents an entirely different set of circumstances. That was on-ice. 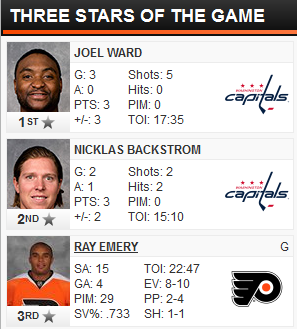 Ray Emery was on the clock. If Holtby and Emery were both eager to drop, the situation is understood. That was not the case. Emery has admitted as much. The NHL, NHLPA and Flyers organizations were all within their rights and, arguably, had an obligation to speak out or act out in this matter. In reality, their silence, in both cases, says it all. Late Saturday in Columbus, Gary Bettman finally allowed that "nobody liked what it looked like" regarding Emery. Meanwhile, according to Aaron Portzline of the Columbus Dispatch, the League will look into changes to avoid fiascos in the future but since "there was no rule that was violated to elevate things to a suspension," the incident will get the "Oh, well" treatment. As will Varlamov's predicament. Never you mind that Sean Avery was once suspended 6 games for his "sloppy seconds" comments which harmed exactly ZERO people and only made himself look like a jerk. Until there are changes made, thugs in the NHL can feel free to repeatedly punch opponents not willing to fight in the back of the head and take a simple misconduct penalty per the NHL's rule book. And the NHLPA can continue to silently do whatever it is they do to protect their members from each other. At least the NHL made it on ESPN.